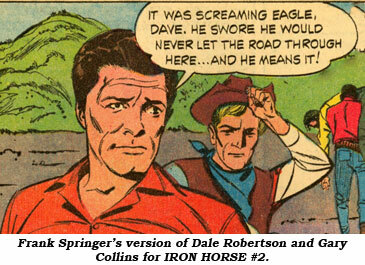 Dale Robertson’s “Iron Horse” TV series ran for 76 episodes between September 1966 and January 1968. Dell Comics did not pick the series up as a comic book until #1 in March ‘67, the tail end of the first season on TV. #2 quickly followed in June ‘67—and then no more. The stories weren’t bad but I can’t say the same for Frank Springer’s scratchy, rushed-looking, minimal art work. Springer (1929-2009) certainly put more effort into his work at DC, Marvel and others than he ever did for Dell on IRON HORSE, BIG VALLEY, CIMARRON STRIP and various movie adaptations. 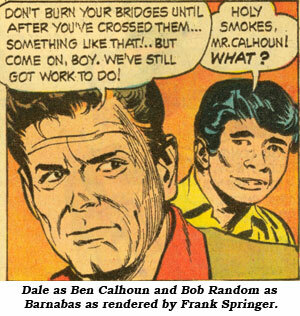 All three of the TV series’ main characters were represented—Dale as B. P. S. & D. railroad owner Ben Calhoun, Gary Collins as construction engineer Dave Tarrant and Bob Random as Barnabas Roberts. 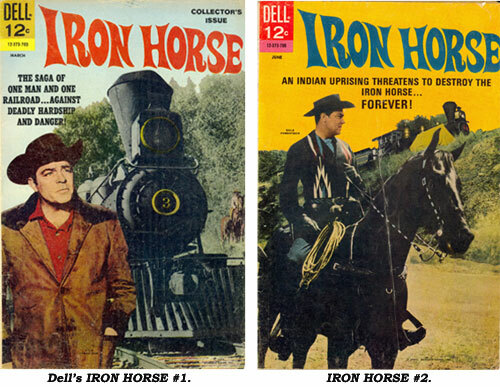 Both issues have mock-up photo covers, #1—Dale by a train engine; #2—Dale on horseback with a train in the distance. An underrated TV series underserved by its comic book counterpart. Copies of both #1 and 2 can be picked up in Fine for $9.